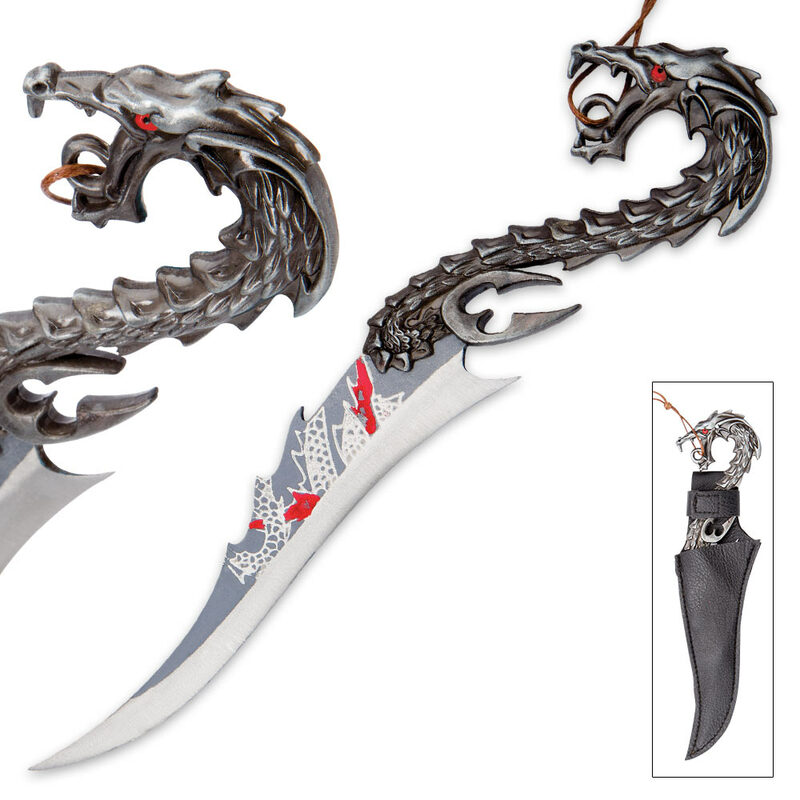 Screaming Red Dragon Fantasy Knife with Sheath | BUDK.com - Knives & Swords At The Lowest Prices! Her size may be slight, but the richly decorated Screaming Red Dragon Fantasy Knife has the menacing aura and stunning design of much larger daggers. A striking cast dragon - mouth agape, posture erect and threatening, red eye glaring - stands in for an ordinary handle. Forged of a tough metal alloy, the vintage pewter-colored fire breather is delicately cast with rich details - feathers, scales, teeth, spikes and more. A lanyard is integrated into the dragon’s toothy bottom jaw, from which dangles a tastefully simple brown beaded tassel. 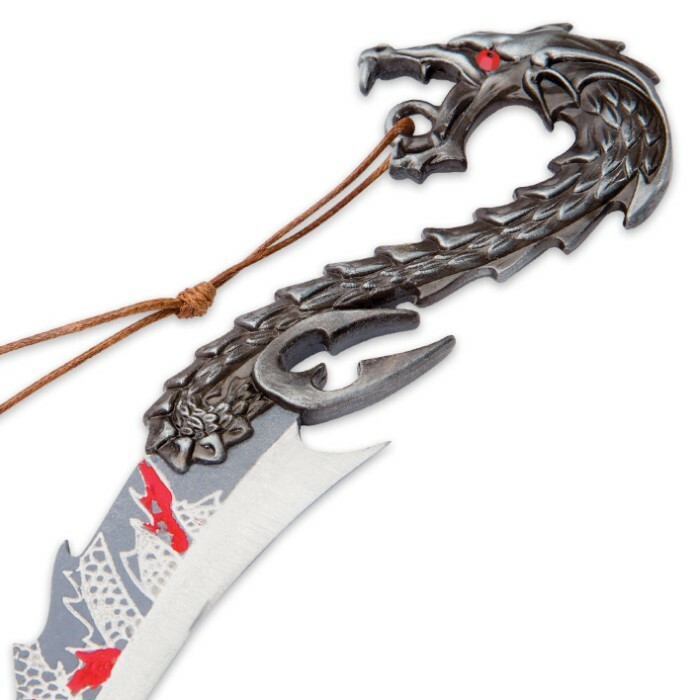 The small but deadly-looking 4 3/4” false edged stainless steel blade features fine silver outlined dragon graphics, offset by smart splashes of vibrant crimson. Displayed amongst larger blades, the miniature Screaming Red Dragon Fantasy Knife is distinct, providing graceful contrast and variation to any assortment of fantasy swords and knives. Looks magnificent on a bookshelf, in a curio case, atop a mantle, hung from the wall of an office, man cave, or hobby room - anywhere that could use a little sprucing up via great fantasy artistry and craftsmanship. Also a great prop for theater, cosplay, screenplays or fantasy conventions. 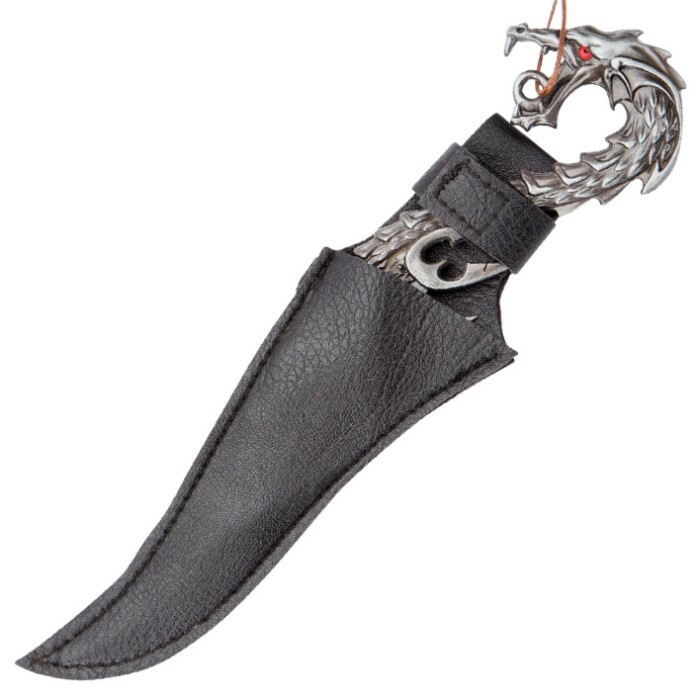 Makes a lovely gift for high fantasy fans, dragon enthusiasts, exotic blade collectors, cosplay devotees and anyone who appreciates fine art and skilled craftsmanship. Measures 7 7/8” long overall. Includes black sheath.